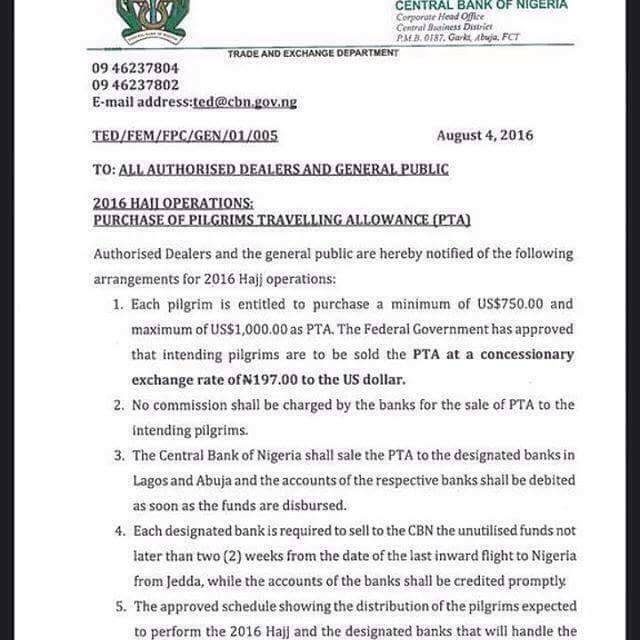 “Each pilgrim is entitled to purchase a minimum of $750.00 and maximum of US$1,000.00 as PTA. The Federal Government has approved that intending pilgrims are to be sold the PTA at a concessionary exchange rate of N197.00 to the US dollar. President Muhammadu Buhari has come under severe criticisms from the masses as he has been accused of lavishing the country's wealth on his religious brethren at a time the country is profusely sliding into recession. President Buhari has also been accused of defiling his earlier promise that his government will not in any way interfere with issues and procedures, financially or otherwise relating to pilgrimages in the country. Christian pilgrimage to Jerusalem will never never be given such a deal by President Buhari. We will see when it's time for Christians to go on their pilgrimage; what Buhari and his northern jihadists will do and say if Christians ask for such a deal. Nigeria is an Islamic state and Biafrans who want to remain in Nigeria can begin now to relocate to north and SW. This gross injustice is enough and marginalization of a people with so much promise and potential is abominable. We must be freed this time.